Get the most out of your device with the mophie juice pack boost. This sleek keychain houses a rechargeable battery that provides the extra power you need to make it to the end of the day. This 1500mAh external battery was created to work with every model and generation of iPod and iPhone. With its unique and innovative technology, the juice pack boost will charge your device twice as fast as any other charger out there--plus it has a super-bright LED flashlight. Special high-output battery allows for ultra-fast charging. Charges at up to twice the current as traditional 500mAh batteries. Take full advantage of everything your device has to offer, such as Web browsing, downloading apps, sending emails, or watching video, without worrying about running low on power. Featuring Apple's coveted "Made for iPod" certification, the juice pack boost provides plenty of extra power to keep you rocking, surfing, and sending all night long. By improving the conversion efficiency, the juice pack boost was designed to get more power to your device. On top of that, the sleek profile makes it easy to slip the juice pack boost into your purse or pocket so it's right there when you need it. The two-tone metallic silver and black soft-touch finish feels great in your hands, and the unique retractable 30-pin connector distinguishes the boost from the rest of the competition. The juice pack boost is full of features that were designed with you in mind. An integrated standby switch built in to the retractable connector allows you to keep the power until you really need it. Our super-bright LED flashlight with intelligent controls ensures you are never out of juice or left in the dark. To top it off, the four LED status indicators let you know how much power is left in the juice pack boost's battery. The LEDs also keep you updated on your phone's charging status when it's plugged in, and they disappear when not in use. The juice pack boost has been certified by Apple Inc. as a "Made for iPod and iPhone" product! 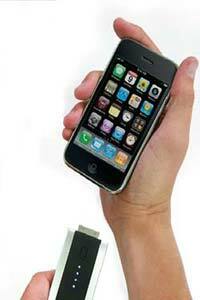 This juice pack is compatible with all generations of iPod, iPod touch, and all iPhone models. Retractable connector allows you to keep the power until you really need it. Special high-output battery allows for ultra-fast charging. Up to twice as fast as conventional batteries. Improved conversion efficiency, which means more power actually makes it to the device (80% vs. our 90%). Two-tone metallic soft-touch finish with a retractable 30-pin connector distinguishes the reserve from other cheaper products--at a competitive price. The four LED status indicator lights disappear when not in use. Our super-bright LED flashlight has intelligent controls. Press and hold the status indicator button for one second to activate; press it again to deactivate. mophie juice pack boost, carabiner keychain, micro USB cable, and user's manual.